ASTER Maloney’s statement that “about ’steen visitors” had arrived in addition to Messrs. Asher, Waterman, and the Rev. Philpotts proved to have been due to a great extent to a somewhat feverish imagination. There were only five men in the room. As Psmith entered, every eye was turned upon him. To an outside spectator he would have seemed rather like a very well-dressed Daniel introduced into a den of singularly irritable lions. Five pairs of eyes were smouldering with a long-nursed resentment. Five brows were corrugated with wrathful lines. Such, however, was the simple majesty of Psmith’s demeanour that for a moment there was dead silence. Not a word was spoken as he paced, wrapped in thought, to the editorial chair. Stillness brooded over the room as he carefully dusted that piece of furniture, and, having done so to his satisfaction, hitched up the knees of his trousers and sank gracefully into a sitting position. This accomplished, he looked up and started. He gazed round the room. “Ha! I am observed!” he murmured. The words broke the spell. Instantly, the five visitors burst simultaneously into speech. The start was good and even; but the gentleman who said “Pardon me!” necessarily finished first with the rest nowhere. 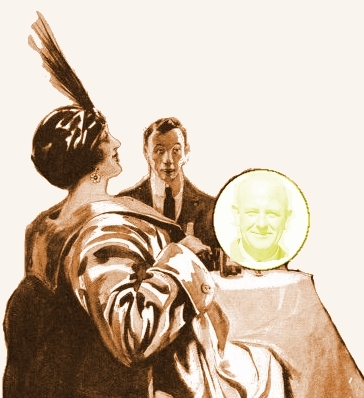 Psmith turned to him, bowed, and fixed him with a benevolent gaze through his eye-glass. “Are you Mr. Windsor, sir, may I ask?” inquired the favoured one. The others paused for the reply. “Alas! no,” said Psmith with manly regret. The visitors looked at each other. “Then maybe you can tell me what all this means?” said a small round gentleman who so far had done only chorus work. “Luella Granville Waterman, sir,” said the little man proudly. Psmith removed his eye-glass, polished it, and replaced it in his eye. He felt that he must run no risk of not seeing clearly the husband of one who, in his opinion, stood alone in literary circles as a purveyor of sheer bilge. Psmith was reading the letter. “It seems reasonably clear to me,” he said. The chorus burst forth. It seemed that that was what they all wanted to know: Who was W. Windsor? Where was Mr. Wilberfloss? The Reverend Edwin’s frosty face thawed into a bleak smile. A man with a face like a walnut, who had hitherto lurked almost unseen behind a stout person in a serge suit, bobbed into the open, and spoke his piece. “These are life’s tragedies,” murmured Psmith. 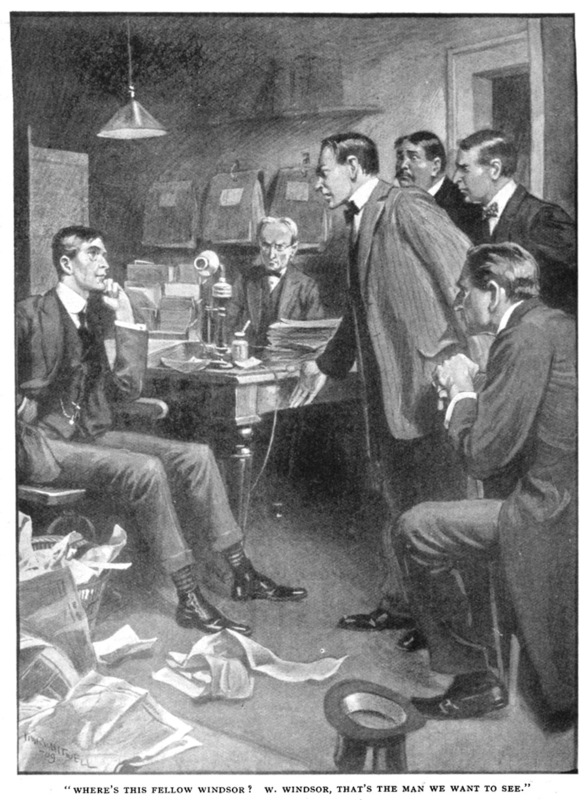 “I am addressing—?” said Psmith. A look almost of excitement came into Psmith’s face, such a look as a visitor to a foreign land might wear when confronted with some great national monument. That he should be privileged to look upon the author of “Moments of Mirth” in the flesh, face to face, was almost too much. The other extended his hand with some suspicion. “You don’t know!” exclaimed Mr. Waterman. Silent consternation prevailed among the audience. Finally the Rev. Edwin T. Philpotts was struck with an idea. “Where is Mr. White?” he asked. The point was well received. “Yes, where’s Mr. Benjamin White?” chorussed the rest. “I have never heard of such a thing,” said Mr. Waterman indignantly. “But what is to be done?” cried Mr. Asher. “All the same, I should like to see this W. Windsor,” said Mr. Asher. Mr. Asher said no, he thought it didn’t matter. “I guess I can wait,” he said. HEN Psmith returned to the office, he found Billy Windsor in the doorway, just parting from a thick-set young man, who seemed to be expressing his gratitude to the editor for some good turn. He was shaking him warmly by the hand. Psmith stood aside to let him pass. “An old college chum, Comrade Windsor?” he asked. They went into the inner office. Psmith removed his hat and coat. Billy Windsor sat down, and lit his pipe. What the bullet was to the Far West editor, the visit of Mr. Francis Parker to the offices of Cosy Moments was to Billy Windsor. It occurred in the third week of the new régime of the paper. Cosy Moments, under its new management, had bounded ahead like a motor-car when the throttle is opened. Incessant work had been the order of the day. Billy Windsor’s hair had become more dishevelled than ever, and even Psmith had at moments lost a certain amount of his dignified calm. Sandwiched in between the painful case of Kid Brady and the matter of the tenements, which formed the star items of the paper’s contents, was a mass of bright reading dealing with the events of the day. Billy Windsor’s newspaper friends had turned in some fine, snappy stuff in their best Yellow Journal manner, relating to the more stirring happenings in the city. Psmith, who had constituted himself guardian of the literary and dramatic interests of the paper, had employed his gift of general invective to considerable effect, as was shown by a conversation between Master Maloney and a visitor one morning, heard through the open door. “I wish to see the editor of this paper,” said the visitor. “Editor not in,” said Master Maloney, untruthfully. An unsolicited testimonial which caused Psmith the keenest satisfaction. The section of the paper devoted to Kid Brady was attractive to all those with sporting blood in them. Each week there appeared in the same place on the same page a portrait of the Kid, looking moody and important, in an attitude of self-defence, and under the portrait the legend, “Jimmy Garvin must meet this boy.” Jimmy was the present holder of the light-weight title. He had won it a year before, and since then had confined himself to smoking cigars as long as walking-sticks and appearing nightly as the star in a music-hall sketch entitled “A Fight for Honour.” His reminiscences were appearing weekly in a Sunday paper. It was this that gave Psmith the idea of publishing Kid Brady’s autobiography in Cosy Moments, an idea which made the Kid his devoted adherent from then on. Like most pugilists, the Kid had a passion for bursting into print, and his life had been saddened up to the present by the refusal of the press to publish his reminiscences. To appear in print is the fighter’s accolade. It signifies that he has arrived. Psmith extended the hospitality of page four of Cosy Moments to Kid Brady, and the latter leaped at the chance. He was grateful to Psmith for not editing his contributions. 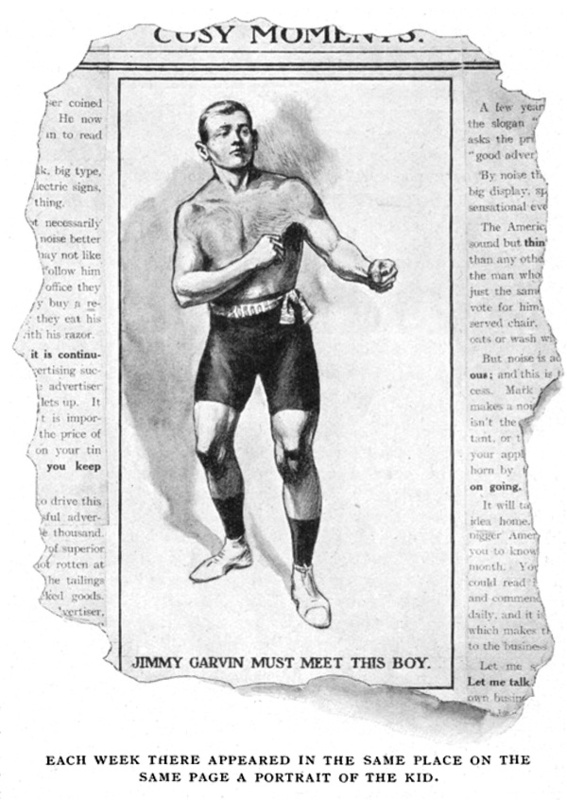 Other pugilists, contributing to other papers, groaned under the supervision of a member of the staff who cut out their best passages and altered the rest into Addisonian English. The readers of Cosy Moments got Kid Brady raw. But the feature of the paper was the “Tenement” series. It was late summer now, and there was nothing much going on in New York. The public was consequently free to take notice. The sale of Cosy Moments proceeded briskly. As Psmith had predicted, the change of policy had the effect of improving the sales to a marked extent. Letters of complaint from old subscribers poured into the office daily. But, as Billy Windsor complacently remarked, they had paid their subscriptions, so that the money was safe whether they read the paper or not. And, meanwhile, a large new public had sprung up and was growing every week. Advertisements came trooping in. Cosy Moments, in short, was passing through an era of prosperity undreamed of in its history. At this moment Master Maloney entered, bearing in his hand a card. Mr. Francis Parker proved to be a man who might have been any age between twenty-five and thirty-five. He had a smooth, clean-shaven face, and a cat-like way of moving. As Pugsy had stated in effect, he wore a tail-coat, trousers with a crease which brought a smile of kindly approval to Psmith’s face, and patent-leather boots of pronounced shininess. Gloves and a tall-hat, which he carried, completed an impressive picture. He moved softly into the room. 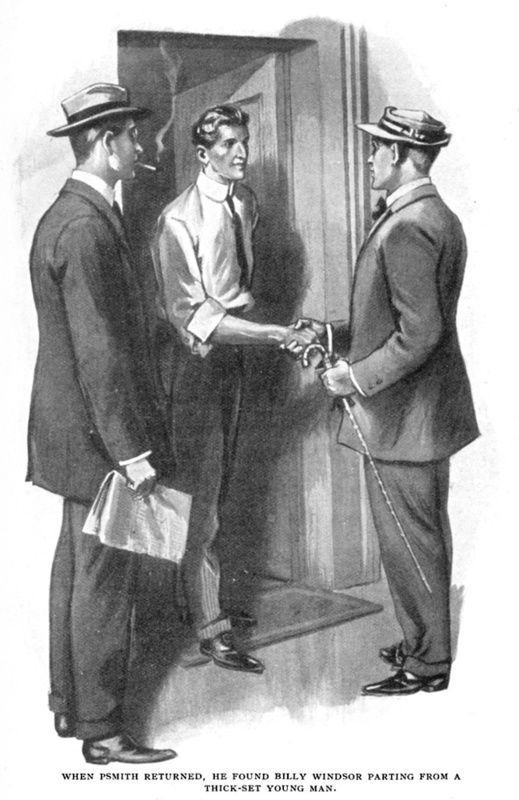 Psmith waved a hand towards Billy. He pushed a chair towards the visitor, who seated himself with the care inspired by a perfect trouser-crease. There was a momentary silence while he selected a spot on the table on which to place his hat. “You can take it I am,” said Billy. “I see.” Mr. Parker paused. “They are—er—very outspoken articles,” he added. “May I speak frankly?” said Mr. Parker. Billy Windsor suddenly became militant. There was a feline smoothness about the visitor which had been jarring upon him ever since he first spoke. Billy was of the plains, the home of blunt speech, where you looked your man in the eye and said it quick. Mr. Parker was too bland for human consumption. He offended Billy’s honest soul. Psmith waved a deprecating hand. Mr. Parker’s smooth face did not change its expression, but he came to the point. “I should not go on with them, if I were you,” he said. “There are reasons why you should not,” said Mr. Parker. There proceeded from Billy a noise not describable in words. It was partly a snort, partly a growl. It resembled more than anything else the preliminary sniffing snarl a bull-dog emits before he joins battle. Billy’s cow-boy blood was up. He was rapidly approaching the state of mind in which the men of the plains, finding speech unequal to the expression of their thoughts, reach for their guns. Mr. Parker coughed. A tentative cough, suggesting that the situation was now about to enter upon a more delicate phase. Billy and Psmith waited for him to begin. From their point of view the discussion was over. If it was to be reopened on fresh lines, it was for their visitor to effect that reopening. He looked expectantly at Billy. Billy’s eyes were bulging. He struggled for speech. 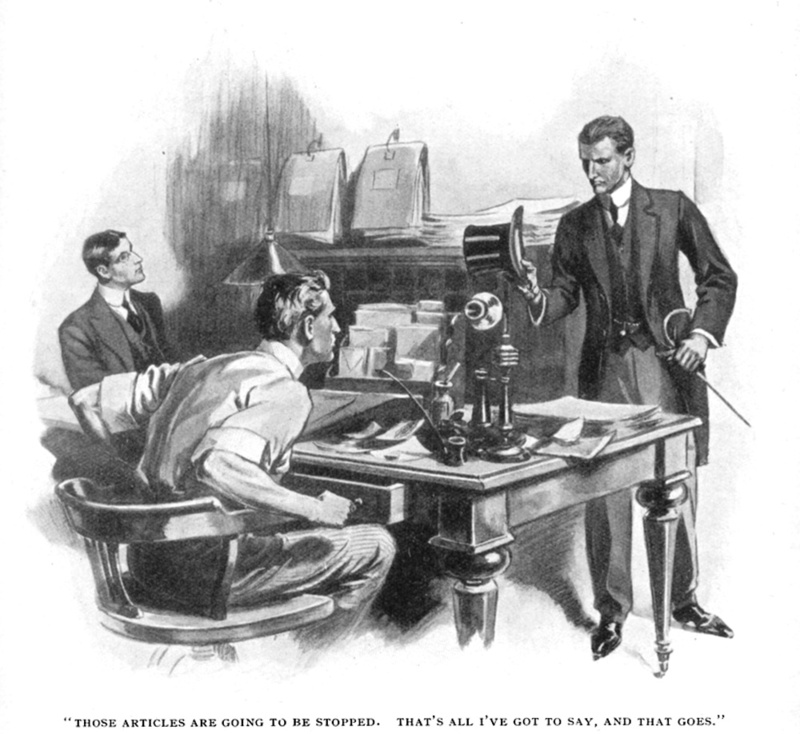 He had got as far as “Say!” when Psmith interrupted him. Psmith, gazing sadly at Mr. Parker through his monocle, spoke quietly, with the restrained dignity of some old Roman senator dealing with the enemies of the Republic. “There’s nothing more to be done then,” he said. “And do it quick,” yelled Billy, exploding like a fire-cracker. He went out, closing the door behind him with a bang that added emphasis to his words. Billy Windsor was looking serious.